Start with an idea and build something of value to the world. Fresh from a freezing start to 2019 in Massachusetts, USA, QUT’s Professor Rowena Barrett is stoking the fires to fuel an “entrepreneurship ecosystem” for Queensland. A spider’s web of influential people from entrepreneurs, academia, and government to corporate and risk capitalists who work together to develop and support innovators to bring their ideas to market. But Professor Barrett doesn’t sugar coat. The Executive Director of the QUT Entrepreneurship Initiative says not every idea will succeed. Timing can be crucial. Investment and hard work is often needed. Success can’t be guaranteed. She does, however, encourage students to ‘have a go’. “We know university is a staging post in an individual’s life,” she says. “It’s an incredible time to learn and try new things. “Increasingly, students need entrepreneurial skills that are transferrable across industries and organisations. So far, it’s a thriving space. QUT’s Entrepreneurship Initiative has the world’s leading university in creating founders of businesses – MIT - paying attention, as well as that of a Prince. The Duke of York visited QUT as part of the Pitch@Palace program where he explored robotics, health and scientific innovations. During the tour, Prince Andrew quizzed Professor Barrett as to whether entrepreneurship was an innate trait of people or if it could be taught. Her reply was as swift as it was emphatic. “Entrepreneurship can be taught and is being taught,” said Professor Barrett. QUT’s Entrepreneurship Initiative focusses on inspiring students and developing their entrepreneurial competence to complement a swathe of subjects as individual units, a university-wide minor and post graduate courses. The passionate educator has taught across all levels from large first year management classes to MBA and tailored executive programs. Fostering a culture at QUT to enable students to learn entrepreneurship is also being backed on a global scale. MIT has chosen to host its prestigious Innovation and Entrepreneurship Bootcamp at QUT in 2019, for a third year in a row. Since its inception, the Bootcamp has produced more than a 100 new ventures. Some 250 people from 52 countries have attended the Bootcamp at QUT. In a pressurised environment, Bootcampers must fast forward the process of what would be the first two years of a new venture into a week. 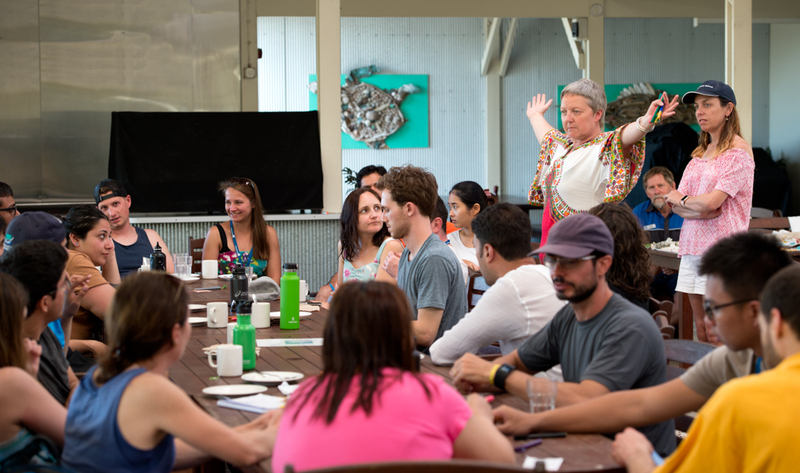 Professor Rowena Barrett with arms outstretched, teaching a group of MIT Bootcampers at Lady Elliot Island last year. Professor Barrett is also a member of MIT Regional Entrepreneurship Acceleration Program (REAP) Team Queensland, led by QUT’s Deputy Vice Professor Chancellor Arun Sharma, to help stimulate innovation-driven entrepreneurship in the state’s key mining, agribusiness and environment sectors. Team Queensland’s plans are aimed at having broad economic impact at a regional level, recently demonstrated to international delegates during the MIT REAP workshop from 29-31 January, in Brisbane. Professor Barrett’s own web of influence is as wide as is its depth. She has a sizeable research portfolio including, books, journal articles, practitioner papers and contributions to publications about entrepreneurship, small business development and human resource management. She’s spent time in Silicon Valley and blogged about the London start up scene. Her own entrepreneurial journey had humble beginnings. With her best friend as co-founder, she founded a business to publish specialised school-based resources, a gap in the market they filled during the early 90s in Victoria. “We bootstrapped before anyone knew what that term meant,” she recalls about the experience, financing the venture through sales and their own equity. Professor Barrett stepped out of the business as her focus changed, concentrating on an academic career. “My co-founder made a nice additional income from it for years,” she recalled. Her passion now is providing inspirational opportunities for students to learn and to nurture the germ of an idea, incubate it, develop a solution and wow the world. Think of the underwater robot culling crown-of-thorns starfish that also transforms into a rejuvenating spreader of baby corals to damaged reefs. Or a soft beanie that turns to a hard hat upon impact. Or an APP to help the vision-impaired catch a bus. All, QUT-based innovations. All launched in 2018. Rowena Barrett’s starting point is helping others to start with something and take it somewhere. After hours: Rose Trapnell, 0407 585 901 or media@qut.edu.au.